of all three compartments before they are finally moved outside. 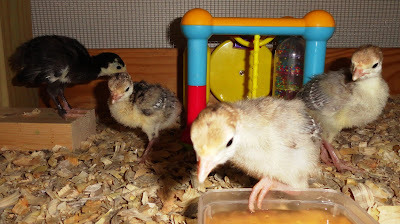 All four turkey poults have been moved into the living room brooder with their heat lamp. 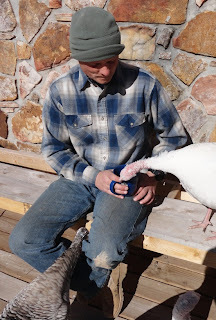 Raising turkeys inside the house makes it easier to control temperature, monitor their food and water, and stay on top of cleaning tasks. If there's any smell at all then fresh shavings are immediately added, ensuring that the poults have a perfectly clean environment. Nobody wants to live in a smelly house so we're highly motivated to keep the brooder absolutely clean at all times! 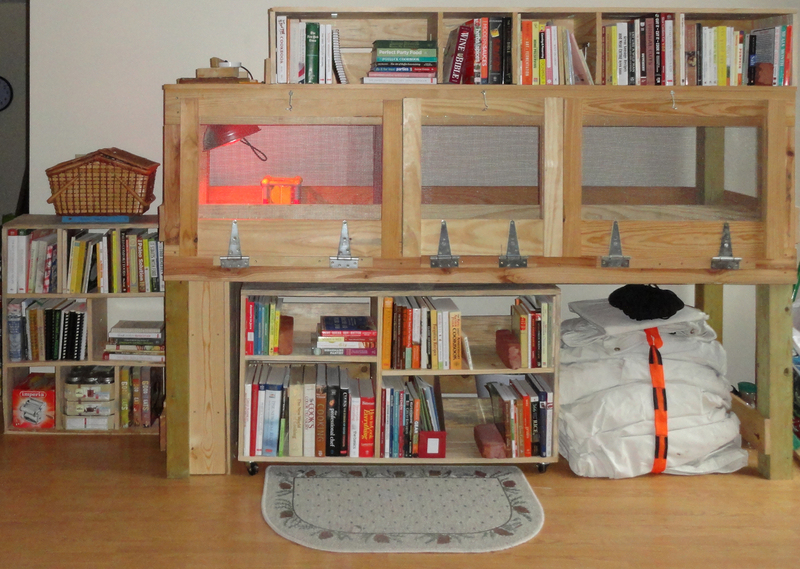 inside the living room brooder. Watching people constantly walking through the house and stopping to talk with them also reduces the problem of boredom, which can lead to fighting and other behavioral problems. With this same thought in mind the poults are provided with various interactive toys that they can peck, scratch, and perch on. At this age they particularly like their "funhouse" (that is, the Earlyears Curiosity Cube designed for human babies) - they spend hours flipping the mirror panel, pecking at the sliding disks, spinning the rattle, and just sitting inside or on top of it. Valhalla's main turkey flock was raised in this same living room brooder, and to this day all turkeys on the property have access to various toys. Toys designed for large parrots hang above the roosts in the Turkey Chalet so they have something interesting to do while confined inside close quarters at night. This has dramatically reduced fighting within the flock - although there are still some squabbles over who gets to roost by which toy! One Narragansett hen in particular won't let any other turkey sleep next to her favorite toy, and quite often she'll come back to play with it by herself during the day. Another big favorite turns out to be music - when the poults get too hyperactive in the brooder we'll simply turn the electronic keyboard on to "Demo" to play dozens of different songs; they'll almost always stop in their tracks to listen, so it is a very effective method for calming them down. 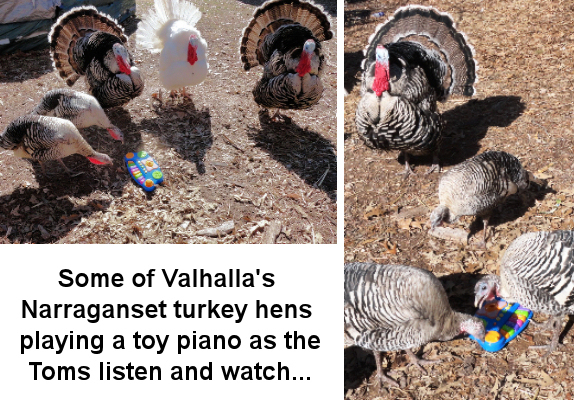 Many of the adult turkey hens really enjoy playing piano, although the Toms seem to think that activity isn't particularly dignified. Regardless, they still stand by and listen with great interest whenever the toy pianos come out, quite something to see! Why all this effort to raise happy, well adjusted, and friendly turkeys? Because every Soldier who has ever come to Valhalla end up enjoying their company so much, and they have become the hands-down favorite farm animals here. We've had Soldiers fall asleep with turkeys in their laps, Soldiers have long private discussions with them, and Soldiers allowing turkeys to drink iced tea out of their own cups. Various other programs around the country offering horses and specially trained dogs to Soldiers as therapy animals, while Valhalla's turkeys have repeatedly proven their value as very special companion birds.